If I were to tell John Woo that my dog was missing or that there was a small piece of metal in my cheeseburger, I bet he could make a 2-hour film on it, throw in some amazing visuals (like only he can!) and probably con you into thinking that you enjoyed what was a good movie. That's what this one is - one big con job. Natasha Binder is searching for her long-lost father in New Orleans. She learns that he is a homeless person and enlists the help of Chance (Damme), a dockyard worker. Then she is told that her father died in a building fire. Chance is not convinced - she goes to the place, and after some complicated deductions, decides that Natasha's father was murdered. Wyclef (Lance) is the villain of the piece, and the man we now know as Imhotep of The Mummy is his right hand man. Anyway, all of a sudden people are running, people are getting shot - basic mayhem. Chance and Natasha disappear from the story for quite a while and as soon as they come back, they are running! No use asking why - I'm pretty sure only a very small secret group knows the answer to that. That's pretty much it - there is an extended climax where Damme happens to be even more invincible than our Bollywood heroes - and we though that that was near impossible. The baddies are killed and everyone's happy. I first saw this movie 6 years ago. Since then, Van Damme has learnt quite a bit about the nuances of the English language and can at least make himself partially understood. Also, wrinkles have appeared due to excessive use of those dormant facial muscles. Lance and the Imhotep-guy have lost a lot of hair in these six years but John Woo has just refined his way of passing off crap for good cinema. This is one movie with absolutely no storyline - but I guess Woo didn't get too much time off from concentrating on his pigeons and Damme's muscles to think of silly things like stories. This film is not worth it even for Van Damme fans. AS,you dont have taste.This one is a great action movie,very rare. fullhyd.com has 700,000+ monthly visits. 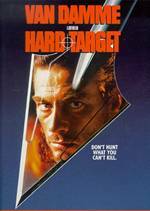 Tell Hyderabad what you feel about Hard Target!